Breakfast has to be my favorite meal of the day...along with lunch and dinner. I really love making breakfast and I love eating it. I can't understand how some people don't eat it! You know who you are!! If you are trying to lose weight and think skipping breakfast will help, you are wrong. Breakfast helps speed your metabolism; just so you know. Breakfast really means breaking the fast after going a whole night without eating, unless you are one of those midnight snackers. At our house pancakes are definitely on the top of the list, but we also love granola. 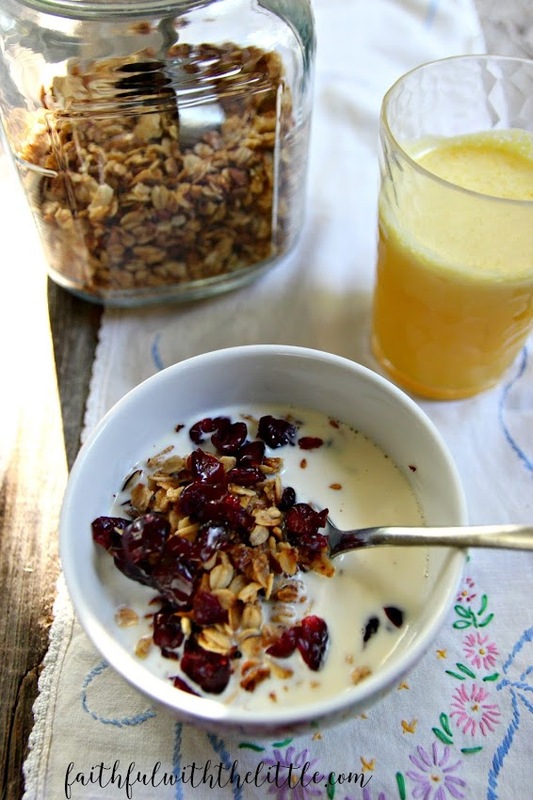 Granola in milk, with yogurt or for making into granola bars. 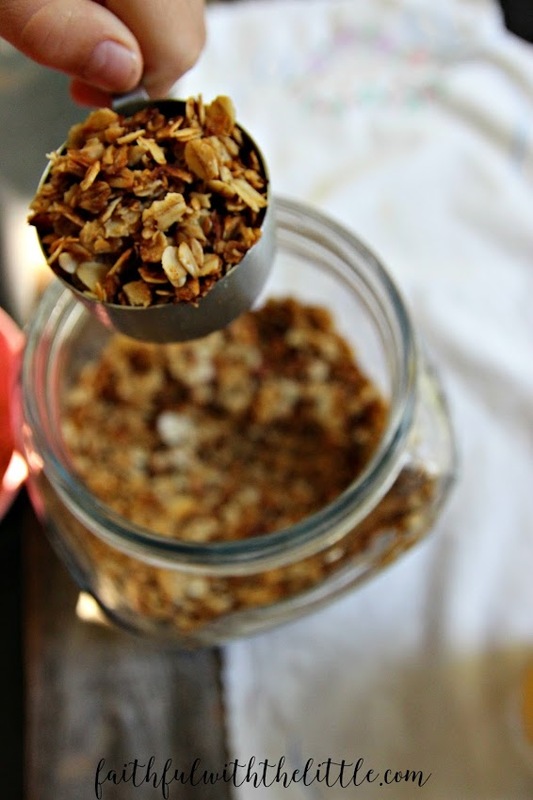 I never even knew you could make granola till a couple of years ago. Boy was I missing out. It is so much better than store bought and you know exactly what is in yours. There are many different kinds of granola you can make but I have found one that suits us perfectly. The first time I made granola, I followed the recipe precisely and it came out burnt. Don't you hate it when you try so hard to make something and just doesn't come out right? I do, I can't stand it! I have actually shed tears of disappointment over my many failed attempts. But the saying, " If at first you don't succeed, try, try again," Is true! I came to realize that just because you follow the recipe to the T, doesn't mean it will always turn out. As I have been learning to cook and bake knew things, I have found that you have to start being able to judge things for yourself. Like if the recipe says keep it in for 45 minutes but it starts to burn at 30 minutes...don't leave it in for the next 15 minutes!!! I have found what works best for me, but don't be afraid to find out what works best for you. Remember your oven or even your measuring cups may be different than mine. 1.In large bowl whisk honey, oil, vanilla and cinnamon until blended. The granola may tend to stick to your pans while cooking so you might want to put aluminum foil down to save you the mess. - Melt 4Tbs of butter in a pan add 1/2 peanut butter and 1 bag of mini marshmallows and add to 4-6 cups of granola. Spread in a buttered 9x11 baking dish and let cool. Walla...peanut-butter granola bars..Yum! Once you start making your own, I don't think you will ever go back...I haven't. Love the pictures! I will have to try this recipe, the first (and only) time I attempted to make granola I burnt it as well. thanks kim! yeah it took me a while before I figured it out. 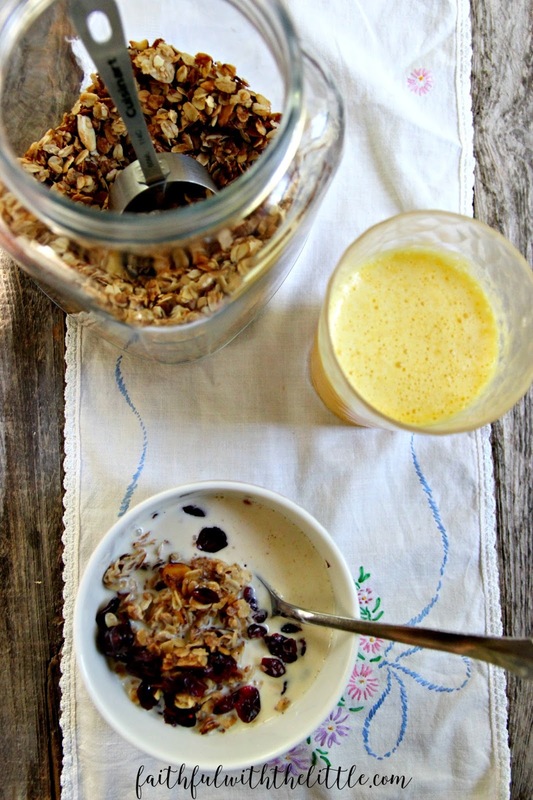 We love homemade granola, usually in yogurt. I haven't made any in a while though . . . should add it to my list of things to make soon! I love homemade granola in my yogurt in the mornings. Thanks for linking up with us at Family Joy Blog Link Up Party this week. Have a lovely week!